Claiming for Artex ceiling repairs? Beware - It could contain Asbestos! Artex ceiling repairs should be treated with caution as they may contain asbestos! If you’re claiming on your insurance for your repairs, it’s important to choose the right contractor to ensure your repairs are treated with care. This is because, white asbestos (Chrysotile) was widely used to strengthen Artex textured coatings, until it was banned in 1999. As a result, Asbestos is being found in properties decorated with Artex during this time. 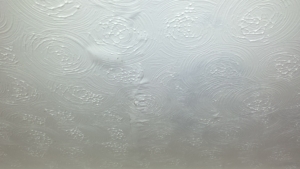 Water damage to Artex ceilings is very common, usually due to a burst or leaking pipe above. However, unfortunately there are a lot of home owners and contractors who are unaware of the potential dangers of disturbing Asbestos. As a result, a lot of Artex repairs are carried out without testing it first! Please note that textured coatings only pose a risk when you damage or disturb them. So if your Artex needs repairing – don’t panic we’re here to help! We never start any repairs to damaged Artex ceilings until we test it for Asbestos. 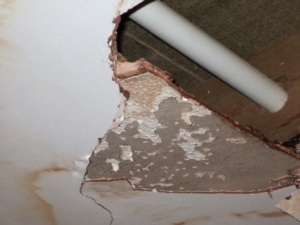 Over the years, we’ve managed many water damage claims involving Artex ceiling repairs. Before starting any repairs, we always test the Artex first. Not surprisingly, a large number of the samples we test contain Chrysotile. That’s why it’s important to choose a professional company like IC Assist to assess and repair the damage to your Artex ceiling. We can repair all types of Artex ceiling damage. Our team can renew all types of Artex/textured ceilings from simple patterns such as stipple, peel or broken leather to swirl, circle, shell and circle and more. We don’t install any air movers to aid property drying until it is safe to do so. Industrial fans or air movers shouldn’t be installed as part of the drying process until it’s confirmed there is no asbestos. This prevents Asbestos fibers being blow throughout the property, if for example the ceiling unexpectedly collapses whilst waiting for the test results! As can be seen in an article from the Guardian. It not only shows the hidden health hazards of asbestos. 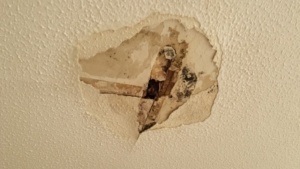 But is also shows the problems a homeowner was facing when his Artex ceiling collapsed due to a burst pipe whilst air movers were running in his property. Some customers prefer to replace their damaged textured ceiling with a flat, modern plaster finish. As textured ceilings aren’t as popular as they were, some of our customers take this opportunity to change their damaged ceiling to a modern, smooth plaster finish. So if you would like to do this, then that it not a problem. To see an example of this type of claim, please see the picture at the beginning of the page. We took these pictures during the re-decoration of a living room following a leak from the en-suite bathroom above. We didn’t start any work until a sample was taken and tested. In this instance, the laboratory didn’t find any asbestos. Therefore, we cut out the water damaged plasterboard and coving so that we could renew it. As the customer didn’t want the ceiling re-Artexed, we scraped back the high points of the remaining textured coating. Then we applied a two coat plaster skim, before re-decorating the entire room. 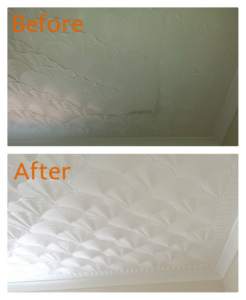 The other before and after pictures shown are another example of a damaged Artex ceiling replacement. 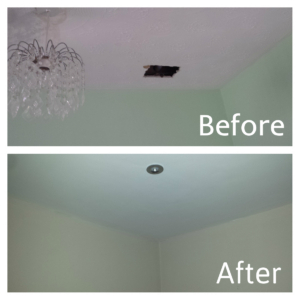 On this claim, the Artex ceiling was damaged as a result of an access hole being cut to locate and fix the leaking pipe.This customer used this opportunity to completely modernise her lounge by having spot lights installed and complemented this with a nice flat plastered ceiling instead. Beware! Asbestos can be under plastered or wallpapered ceilings. Asbestos found in Artex beneath plastered ceiling. As textured coatings have gone out of fashion, many homeowners cover up their textured coatings with plaster. Therefore, you still need to be cautious – even when dealing with repairs to a plastered ceiling. This is because there may be Asbestos in the Artex coating underneath the plaster finish. A few years ago, we managed a claim involving a damaged plaster ceiling. The Loss Adjuster thought there was wallpaper beneath the plastered finish ( see picture). However, we suspected it could contain white Asbestos. So we tested the old ceiling (underneath the plaster) and it did contain Asbestos! Fortunately, the customer chose IC Assist to survey the damage to his property. As if we weren’t managing his claim, the Loss Adjuster wouldn’t have tested it! Associated costs with the removal of an Artex ceiling that contains asbestos. 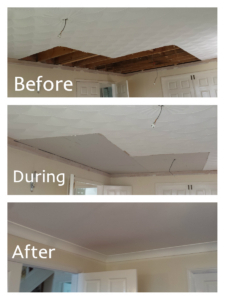 We also recently managed a claim with a plastered ceiling which looked perfectly fine on the surface. However, once our surveyor cut into the damaged ceiling, he could see an old Artex ceiling hiding beneath. Again, we tested the area and it did contain asbestos and the insurer paid to safely remove the whole ceiling. A complete solution to your Artex ceiling repairs – including asbestos sampling, testing and removal. IC Assist can help with more than Artexing and decorating. We also provide a professional sampling, testing and removal service. If we identify building material that could contain asbestos, we’ll inform your insurer. As soon as your insurer gives us authorisation, we’ll take a sample and then seal the section to prevent any loose Artex falling down. We will then take it to an independent laboratory for testing. If they find Chrysotile in the sample, we’ll instruct our accredited contractors to safely remove it. They will lay protective sheeting, seal of the working area and then thoroughly clean the room. To ensure the room is safe for re-occupation, we will instruct an independent firm to carry out a reassurance air test. This ensures the air is clean and safe (in accordance with the Health and Safety Executive guidelines). The before and after pictures show a cracked Artex ceiling that contained Asbestos. Our licensed contractors safely removed the entire landing ceiling and coving. Once the air test was complete and it was safe to re-enter, we were able to re-instate the property. This involved fitting new plasterboard, loft insulation and coving, before applying a shell and comb Artex pattern. Once dry, we then decorated the hall stairs and landing. To see how we manage the safe removal of Artex ceilings containing Asbestos, take a look at Google+ profile which has pictures of the entire process. This burst pipe claim involved replacing an Artex ceiling in the bathroom which was sagging due to the weight of the water. Cracks also appeared in the textured lounge ceiling as a result of water pouring out. Both ceilings tested positive for Asbestos and were safely removed by our HSE licensed contractors. Asbestos removal can be costly, however it is important to remove it safely for the benefit of you, your family and the contractors. Many people try to save money by not testing their damaged Artex. Doing this however, potentially puts everyone at risk. So, before you carry out any repairs to your damaged Artex ceiling, please ensure you test it first. As you could put everyone in the property in danger! Please note, there are a lot of contractors who don’t know how to identify Asbestos. So be aware that they may carry out repairs and disturb it without realising it. That’s why it’s important to choose a company like IC Assist. We know how to identify Asbestos and will tell you if there are any building materials that could pose a threat. We can help with all types of ceiling repairs – including plaster, plasterboard and lath and plaster. As ceiling repair contractors, we can help with more than just Artex ceiling repairs. 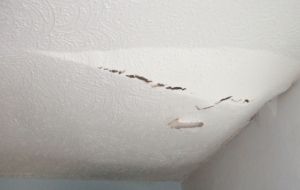 We can repair all types of ceiling damage and can fix anything from minor water stains or holes to collapsed ceilings. So if water has damaged your plasterboard, plaster, Artex or lath and plaster ceiling just leave all the repairs to us! We have been repairing water damaged ceilings since 2011 and have many satisfied customers.